King Arthur is a famous British leader of yore who, in the early 6th century, led the defense of Britain against the Saxon invaders.. Folklore and legend fill in many of the details of King Arthur's story that are not recorded in history. These stories tell of a wizardly adviser named Merlin, the sword Excalibur, Sir Lancelot and the Knights of the Round Table. Today the legend of King Arthur lives on in mostly fictional interpretations for theater, film, television and other media. 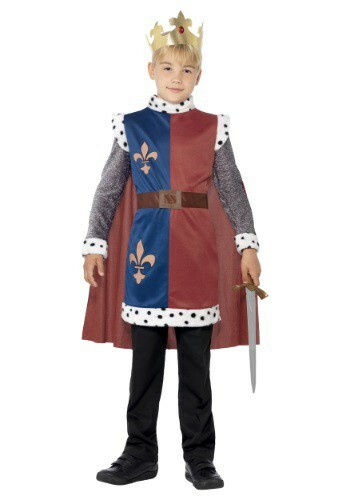 Get your King Arthur costume today! 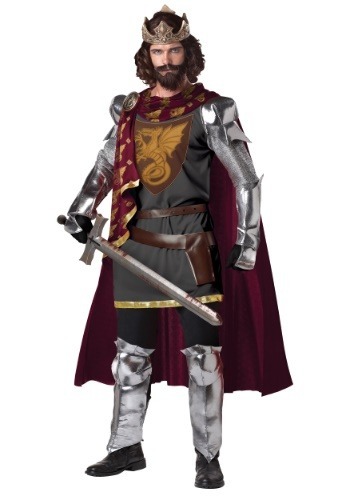 Rule in style in a King Arthur costume with a regal and righteous nature. A red tunic with dragon design features attached sleeves, a cowl neck and cape. Add your own tights and jeweled crown headdress. An Excalibur sword, dagger or other royal weapon will give your King Arthur costume an authentic look. Gather the guys round your own round table, dressed in knight costumes, coats of armor and other Medieval inspired get ups.